Or to take Coin from a Sea of strangers? There's not much to report on the Codename:Vacuum front this week, I'm in the middle of overhauling the locations and exploration as discussed last week, and now my laptop has died so I'm not even making much progress on that. I'll be going along to the next Newcastle Playtest session on Tuesday, but with no game of my own - just helping test other designers' games. So seeing as I've nothing worthwhile to say about my achievements this week, I thought I would address a question I regularly get asked by other gamers, when they hear I'm designing games: "So, (when) are you going to KickStart it?" Before I delve into my thoughts on KickStarter and how it applies to Codename: Vacuum, here's a little background on my experiences with KickStarter. I've only KickStarted one project, and it wasn't even a board game. It was a trade paperback of a comic that had previous been released as single issues. I liked the art on the KS page, the comic had won awards and I would get a trade paperback and a T-shirt for £25, which is a reasonable price. It arrived a couple of months later than originally envisaged (though the communication explaining why was alright) and in the end I was slightly disappointed, the art is nice, but the whole thing seemed a bit short and the story didn't wow me. Why haven't I KickStarted any games you ask? I don't actually buy that many games, and the games I do buy tend to be ones I've tried beforehand and really liked - things that I think will get lots of play at Games Night or with other friends. I don't collect games for the sake of it, I buy them to play. With The Daughter in the house now, I have less disposable income so, if anything, I'm more picky about which games I buy. Games on KickStarter have rarely been previously released, so you are usually buying a game you haven't tried and which there is limited information about - as a result the risk of getting something that doesn't meet your expectations is much higher than when you've already played the published game. And it's probably that last point that is my biggest hurdle with KickStarter. KickStarter has really lowered the bar to publishing games. Previously, you would have either had to get a publisher to pick up your game (very hard) and then suffer the changes that result from their development of your game or you would have had to stump up a lot of your own cash and take a punt. There are far more designers and games out there than there are games getting published by the major publishers, so getting one of them to pick up your game is difficult, and even if you manage it, you cede editorial control of your baby to them. Which will usually improve it, but is often a hard cross to bear, especially when you think the game is perfect as it is. The other option requires you to have a dirty wad of cash, to convince your family to part with said dirty wad and then to part with that and potentially lose it all. That takes some guts, and even if your game is great, you can fail (and lose your cash) if you're not good at the marketing side of things, regardless of the qualities of your game. I know, I've been there. With KickStarter, those hurdles evaporate. You don't need to get in to the big publishers, you don't need to cede control and you don't need to stump up your life savings: you get a bunch of people on the internet to fund it for you. Yay! Cash flow problem fixed! @natebrett Most KS board games I've played were merely ok (or straight-up bad). I think the developer role is key, and they're missing that. If you're publishing your own games, it's very difficult to achieve the critical distance needed to objectively decide how good it is. If you're risking your own money then decisions about what to publish are brought into sharp relief: "Is this going to lose me £15,000?" I rarely buy games without trying them, and KickStarted self-published games make me even less likely to because of my concerns about game development and quality. I've not got much experience of KickStarted games, so I'm probably tarring them all unfairly, but it's something I'm worried about, and it puts me off backing any of them. So if I'm unlikely to back other peoples' KickStarted games, it's a bit rich to consider posting one myself. Especially since the more games you back the more likely you are to get reciprocal backing from those games' publishers. On top of those concerns, I'm not sure that Vacuum would be a good fit for KickStarter. I can't see sensible pledge levels, with a game with so many different cards (and hence so much art required) the entry level would need to be quite high - putting people off. Of course, I'm not saying never, but certainly at the moment it seems unlikely. I'd be interested to hear about your experiences with KickStarter, am I being unfair? Have you been delighted with the games you've KickStarted? Or disappointed? Let me know in the comments below. Receiving 'finished' submissions while running Reiver Games. Let me just expand on that last point a bit. While running Reiver Games I was mostly publishing other peoples' designs. So I received a lot of submissions of games that the designers themselves considered ready to publish (I received over 150 I think). Some of them were great. Some of them were just not my sort of thing. But quite a lot of them were poor, or in some cases rubbish. Having seen a lot of these supposedly finished games, I'm more wary of self-published games with little objective information available. I'm probably more wary than the majority of gamers, and certainly more wary than the majority of KickStarter backers. Perhaps that's where my KickStarter reticence springs from. The last couple of weeks have been good to Codename: Vacuum, last week I played it four times on Thursday twice at lunch with Dave, one of my core playtesters, and then twice in the evening at Games Night with Gav and His Nefariousness (my boss). During the four games I was thinking about (and yet not quite trying out) some ideas my friend Paul in York had had when I visited him a few weeks ago. I normally play it once a week on a lunchtime in the office, so four games in a day was pretty awesome (and a first! Clearly, I've not taken it to Essen or the UK Games Expo yet!). It was nice to get some steam up, play it a lot and get a feel for how it can differ between games. We found a few flaws that needed addressing and I got some useful feedback too. This week has been another busy one, with four games again - this time spread between two days. 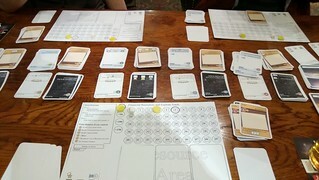 On Tuesday, I attended my second Newcastle Playtest session at The Bridge Hotel. Dan the main organiser was away, but it was looking like there would still be five of us. Sadly Amo was feeling ill, and Michał's daughter wasn't well, so it was just three of us in the end. Olly who had come along to playtest and Paul, who had brought a game which wasn't in a playable position at the moment, he was about to make some sweeping changes after the feedback he'd received at the last session. And me. With Codename: Vacuum. So we ended up playing it twice with a discussion of Paul's game in between. We started off with a basic game (since neither of them had played it before) and then, with plenty of time to spare and no competition, we played it again, this time with the advanced rules. Neither Paul nor Olly had much experience of deck building games, but they both picked it up quickly and seemed to enjoy it. Again I asked them to email me some feedback when they got a chance. At the end of the evening we spent some time discussing the game, with both Olly and Paul coming up with some good ideas. Then we left and Paul and I walked into town together, still discussing the game. Paul's ideas really got me excited and have led to some big changes in the works. It was a hugely useful evening. Playing every week with regular players is great, especially when the game has so many cards and options, it really helps to balance things out; but for a big leap, you really need to get your game in front of new players and get a fresh perspective. After Tuesday's big evening, Thursday was playtesting at lunchtime again and then Games Night in the evening. At lunch, Chief, Dave and I tried some ideas for simplifying the Trade mechanism that had come from Tuesday's feedback (quickly received via email - thanks Paul and Olly!). They didn't quite work on first attempt, but seem to be heading in the right direction. In the evening, Dave (again) and Gav (after more since last week) and Mike (who'd not played in a while) settled down for a four player game - which hasn't happened in a while. Again, the Trade simplification was all out of whack, but I still think that Olly's comment about the old way being to complicated was right on the money. What I'm really excited about though is the ideas that Paul had/triggered regarding exploration. For the last six months or more, Vacuum has had 42 location cards representing places in the solar system that you can explore, capture and trade with. To explore them, you'd draw a number of cards from a deck and pick the one you fancied. Fairly standard mechanism in a card game. But the cards were always the same, and there were only 42 of them, so there wasn't much excitement to be had. Each location was potentially worth some points for exploring, some for capturing and possibly provided population, trade and/or defence. You looked at the cards you had drawn and choose the one the best suited your strategy (or least suited your opponents') and then revealed it. It then sat in known space until someone captured it. Paul's comment that triggered all these changes I'm now working on? "In a Steampunk game, I want to be attacked!" It made me think about the way new locations come out. You choose which range you want to explore at, and then choose from a random selection of locations at that range. Doesn't sound very thematically accurate does it? "I want to send a probe to the outer solar system, I'll decide what to look at when I get there!" That's just how NASA work, honest. So, I've decided to completely change things. There will be fewer locations, and they'll all be available from the beginning. You choose exactly where you want to go and send you probe there. Upon arrival, you'll encounter a random event which might provide an alien population, or a fight or a deposit of valuable minerals, or the loss of your probe. I'm hoping this will make exploring more thematically accurate, more interesting and provide more replayability as each game the location's events will differ. I'm also hoping it'll add to the theming of the game as a whole. My aim is to make a thematic game, not a dry themeless one, and lack of theme was the main criticism of Vacuum's first outing at Newcastle Playtest. I'll not be able to play it for a couple of weeks while I make all these changes and assemble a new prototype, hopefully in time for the next Newcastle Playtest, but we'll see. Of course, when the new prototype turns up it'll be much less well balanced/possibly broken, so I'll have to start playtesting again almost from scratch. Thursday was Day of the Vacuums, it's like Day of the Triffids, but more mineral than vegetable. It was Games Night that evening and Gav had expressed an interest in playing Codename: Vacuum again, and I'd arranged a Vacuum playtest for the lunchtime too. I managed four games of Vacuum and learned a lot and got a load more ideas :). The lunchtime playtest session was with Dave (one of my core Vacuum playtesters), and we'd been discussing the idea of a fixed number of rounds that had come up the previous week with Paul. I'd suggested that we try out the fixed number of turns that lunchtime, and picking a number out of a hat, said to Dave: "How about 16 rounds?". Dave was convinced that would be way too short (we never track the number of rounds, so neither of us had any idea really), so Dave countered with: "Why don't we play a game where we both race to finish it and record the number of turns it lasts, if it's really quick, we can always play another game straight afterwards." So that is what we did. We played a game where we both were consciously racing to bring in the victory conditions early (and hence end the game early since the game ends when a given number of victory conditions have been chosen). The game lasted 23 mins and only 13 turns. Dave crushed my Italian empire, through military might (his standard tactic!). With only 23 minutes gone, we decided to press on and play again, this time we were going to not rush, not drag it out either, but neither of us would go for the conditions early. The second game lasted 19 turns and about 50 minutes. It felt a bit slow to be honest. Dave won again, against my Italians again, and again he had gone military. There are some very powerful military cards in the game, the 'Armada' a fleet of advanced warships which can nail pretty much anything else in the game. The Armada is a level three card, of which there are only four copies in the game, so Dave's strategy is to get at least two of them as quickly as he can. He does it every game, so I know it's coming and when facing Dave I try to do the same to ensure I'm not outclassed. I got the first one, and then Dave got another. I was sat looking at my hand a few turns later, knowing that I could get a second Armada on my next turn - ensuring I would be on level playing field with Dave. Then Dave got two that turn, before I could get my second. Dave now had three to my one, and I was cruising for a severe bruising. Unsurprisingly, Dave played aggressively, stealing my territories and won handily again. I really didn't enjoy the game that much. Getting beaten to the drop on the Armada's pretty much stuffed my game right there at the start. And to be honest, that was largely down to luck of the draw. This was something that needed addressing. Interestingly, my guess at 16 rounds for the fixed game was right in the middle of the 13 & 19 rounds of the two games we played (Dave was suitably chastised!). That evening at Games Night, Gav requested to play Vacuum with me, and The Nefarious Doktor M (my boss from work) was happy to join in. They had both played before, several months ago, and Gav had previously enjoyed it, but Doktor M had seemed less keen. We played a three player game that was over fairly quickly (I think about 35 minutes from memory), and had much less to do with the military, Doktor M got two of the Armadas, Gav and I one each. There were a few scuffles, but nothing major on the combat front. When the game finished, the other table was still only halfway through their game of Thurn and Taxis, so Gav requested to play Vacuum again, and Doktor M acquiesced. The game was heavily trade based, since that was what the advanced cards favoured. In this game, none of us got an Armada, and only one of us got the next rung down: a Warship. The military didn't really feature at all. I won both the games in the evening, not surprising, since I'd played at least 65 games of it, and Gav and Doktor M had played no more than five each, and those several months ago at that. Bizarrely, I was Italy for the third time that day in the final game. It was great to play Vacuum four times in a single day (a first! ), and to really get a feel of several different strategies. I was glad to see the two evening games were very different from the lunchtime ones. It was nice to see the military feature so heavily in the first games, and then hardly at all in the evening ones. I don't want it to be a killer strategy that if you don't play, you lose. Increase the number of level three cards, so it's much harder for one player to mop them all up. Require a level two card when purchasing a level three card - this would slow down Dave's rush for all the Armadas. Armadas have an upkeep that means you can't afford to support loads of them (unless you're very wealthy). You need a given number of locations or population per Armada. I'm keen not to clutter up the rules with more special cases if I can help it, or more requirements and fiddliness on the actions. Ideally the game would become more streamlined as time goes on, not less so. I'm leaning towards trying out the increased number of cards as a result. Initially I chose four each of the level three cards to artificially force players to follow different strategies (in a five-player game you can't all get one! ), but that was ages ago, and I'm not sure there's a good reason to limit them any more. In addition, the feedback I got from the Newcastle Playtest session last month included a request for more level three cards, so I've got external support for that option. Of course, I don't want to increase the component count by much either. In other news, the Newcastle Playtest sessions are now on the 1st and 3rd Tuesday of each month. So see you at The Bridge Hotel from 6:30pm this Tuesday? This week has been a busy one. It started in Bristol, leaving my parents' house before 8am on Monday, then a five hour car journey to York where we spent a few days staying with my friend Paul and his family. I was primary carer for The Daughter while The Wife attended a conference for work (it's alright, everyone survived!). Then finally back to Newcastle in time for a work team building event on Thursday (I found out that I'm good at archery, but rubbish with a shotgun - so stick with someone else come the zombie apocalypse). To round it off, Saturday we had four friends and their four kids under five round for dinner and Christmas homebrew bottling - a busy and slightly chaotic day! It was nice to get out and about, to see my family and The Wife's family in Bristol and then Paul and his family in York (for the second time in just under a month). The team building day was fun, the homebrew bottling is always a fun day if very busy - I'm looking forward to a quieter week next week though. As I mentioned last week, I've recently introduced some changes that speed up the game (particularly for two or three player games), and the first feedback wasn't great. Dave and Chief, my two main playtesters who play most weeks on a lunchtime, were both not fans of the shorter game, feeling that it was too short to really get into the strategies available. On Tuesday, after a few games of X-Wing Miniatures, Paul and I sat down to a game of Vacuum. It was the first time Paul and I had played since July last year. I'm not sure if Paul had played in between (he has had a copy since April, and several people from his Games Night mentioned it, but I don't know if Paul played with them or not). We played the new faster rules, and after the game, Paul admitted that he too did not like the shorter game - he would have liked a chance to get more done during the game. Paul's not a Race for the Galaxy fan, and he saw a number of parallels between Vacuum and Race. He had a number of criticisms, things about Vacuum that he prefers games not to have. He didn't like that the game could end with so little warning, and that he didn't know how long he had left before the end. Despite the fact that I'd been up since 4:45am that morning, and the game of Vacuum didn't finish until about 11:30pm, we spent the next hour or so chatting about ideas of things we could change to improve the game/make it more to Paul's tastes. I was almost asleep on my feet (well I suppose on my bum is more accurate! ), but we discussed a whole range of ideas from fixing the game length to making the victory conditions a random selection that are revealed as the game goes on. It was a very useful conversation. The next morning while I took The Daughter for a walk to get her to take a nap my mind was buzzing with ideas either discussed or triggered by the previous evening's conversation. Upon my return to work I discussed a few of the ideas with Chief and Dave, and I think I'll try out the fixed number of turns shortly. I've also got some feedback from the Newcastle Playtest session I attended a few weeks ago. Both playtesters have sent detailed feedback emails that I need to go through a few times to really take on board, but interestingly, both of them mentioned that the game felt very abstract, with little tie-in to the theme. We played the basic game that night, and I think the advanced game is a bit more themed, but it's certainly something I need to be aware of, since I've been aiming for a tightly themed gaming experience with Vacuum. The fixed number of turns could be implemented with a turn track that counts in years, which might help tie things together. Some of my favourite games are quick ones. I've played well over 200 games of Carcassonne & Magic: The Gathering, over 100 games of Race for the Galaxy and getting on for a hundred games of 7 Wonders. What do they have in common apart from being great games? Speed. They can be played quickly enough that you could play several games back-to-back. And in the days before The Daughter, The Wife and I would frequently play these games over and over. One of my stated goals for Codename: Vacuum is to make it quick to play, so that if I ever get it to the point where it's a great game, people will be inclined to play it over and over. Over the last few months, even playing with Dave and Chief (who've both played over 40 games of Vacuum) the play time was around 25 minutes per player (50 minutes for a two-player game, 1:15 for a three-player game). Not only did I struggle to juggle my hours at work to fit these games in, in my mind this was failing to hit the sweet spot. I can play a two-player game of Race for the Galaxy in 20 minutes. I can play a three-player game of 7 Wonders in less than half an hour - these games benefit from simultaneous player actions, and as a result can be very fast with experienced players who don't suffer from analysis paralysis. That is hitting the sweet spot in my personal opinion. So over the last couple of months I've been trying to tweak the rules to Vacuum to pep it up a bit and decrease the play time. The August version of Vacuum was finished in time for the inaugural Newcastle Playtest session at the beginning of the month, and since then I've been crafting the re-written rules ready to give my friend Paul in York an updated version of Vacuum, replacing the version I gave him back in April. Paul was up in Newcastle a few weeks ago to visit us and meet The Daughter, and during the visit I asked about their experiences with Vacuum. Apparently it had been played a number of times, but one of the major criticisms was that at around 45 minutes per player (!) it felt too long for what it was. No doubt! Clearly it needs knocking up a notch. Well, we're in York for a few days this week for The Wife's work, so we're staying with Paul and his family, experiencing the wonders of his Games Night (which I used to attend twice a week regularly back when we lived in York). I've done the new rules, and though I didn't have time to make a new copy of the game, I can give him my copy, complete with new rulebook, and then I'll make myself a replacement on my return (once the pressure's off!). I've now played the August version three times, once with two new players at the Playtest meetup (the impromptu second one, I missed the inaugural one), once with Dave a couple of weeks ago and once with Chief last week. The first of those games (with the simple rules) lasted about 45 minutes - 15 minutes per player. The second lasted 34 (17 minutes per player) and the third only 20 minutes (10 minutes per player). Awesome! After I played with Dave a couple of weeks ago he expressed concern that the game was too short now. It felt less epic to him and he missed the chance to fully explore his chosen strategy (which is inevitably raining plasma doom on my inocuous backward empire with a wave upon wave of overly aggressive Armadas). His fear was the shorter game would strip several strategies of their usefulness, since you wouldn't have time in the game to get them started before the game's swift conclusion. This week I played with Chief. He won. For the first time in approximately forty games. Dave and I were beginning to wonder if it would ever happen. Was he intentionally taking it easy on us? Did he have a phobia of winning games? (what's that even called?) Had he been lobotomised as a child, and had the winning parts of his brain removed? It turns out none of these. He won. He beat me at a game I'd designed. And he did it in 20 minutes. Schooled. Dave's thoughts on his epic victory, after finally crushing the designer at his own game? He felt the game was too short! I'd really enjoyed the game. We'd been flying through it. Each player's turn regularly taking a handful of seconds. Almost no downtime. It felt like playing Race for the Galaxy against The Wife or 7 Wonders with Terry and Andrew. Blisteringly fast. On top of that, Chief had chosen the Exploration strategy (which can be quite slow) and had got as far as Proxima Centauri, which is quite an achievement as it's particularly hard to reach and requires a real concerted effort to get there. "Ha! ", I thought, "See Dave, even in twenty minutes, Chief managed to reach Proxima, the shorter game isn't too short." Then Chief pissed on my chips and agreed with Dave that the game was too short. He enjoys the chance to explore a wealth of strategies and diversify your deck - possible in the longer game, but not in the new shorter version. So here's a question. I've reduced the game length to my 'ideal' length. I enjoyed the feel of it the three times I've played it. But the two guys who've played it more than anyone else, who play it week in, week out at work, both don't like the changes. Do I cave in and extend the game again, to increase the epic feel, and the wealth of strategies you can explore in a single game? Or do I stick to my guns and ride with the shorter game, possibly admitting that the only two people who will regularly play the game with me might not be the target audience for the game? In other news, the second Newcastle Playtest Meetup is this Tuesday in The Bridge Hotel again. I'll not be there, but don't let that put you off!